Q: Over the last few days, my oven has been giving off smoke while in use but is working normally otherwise. Why is it smoking, and is it safe to ignore, or should I take action to stop it, and how? A: Smoke emanating from the oven door or vent—either as a light haze or dark plumes—should never be ignored. For starters, though you may not have noticed much of a difference in your dinner’s taste the first time this occurred, smoke can negatively impact the flavor and quality of food. Worse than that, though, it can irritate nearby pets or people with respiratory conditions or even signal an impending oven failure or fire. No matter the type of oven in your home, the problem is not altogether uncommon. It occurs in new and old units, electric and gas, appliances with and without food inside, and at any particular operational mode (preheat, bake, broil, or self-clean). Since the right fix will depend on your appliance and circumstances, we’ve outlined the common causes of a smoking oven to clear the smoke and quit for good. Burn off factory coatings. It’s normal to see smoke during the first one or two uses of a brand-new oven since the heating element inside many modern ovens has an oil-based factory coating that produces smoke as it gradually burns off. Because a smoking oven can lend an unsavory burnt taste to food inside, oven manufacturers usually recommend that you “burn in” the oven (i.e. burn off the factory coating) before using it to cook food for the first time. To burn in your oven, turn it off if on, let it cool completely, then remove any pots and pans from the oven racks. Close the oven and set it to “bake” at the manufacturer recommended burn-in temperature (usually between 400 to 600 degrees Fahrenheit) for the recommended duration (a half-hour to an hour). Once you’ve burned in the oven, you should no longer notice smoke during future uses. Remove baked-on food remains. In used ovens, smoke is usually a by-product of the burning of food remains in the oven. If you regularly broil high-fat foods like steaks or bake foods like pizzas directly on the oven racks without a baking sheet underneath, grease can splatter on the roof and sidewalls of the oven and food chunks or debris can fall on the floor. If you neglect to clean these remains while they’re still wet, they can harden, and on subsequent use of the oven, burn, emit smoke, and in rarer cases, catch fire. To stop the oven from smoking, turn it off and let it cool completely. 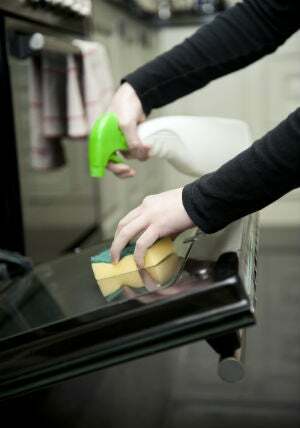 Then, open the oven door and remove any large food chunks from the oven floor with plastic tongs, and manually clean the oven (preferably with natural agents like white vinegar, baking soda, and water) to remove food grease, splatters, and debris from the oven roof, floor, and sidewalls. soon as possible. Turn off the oven and let it cool completely, then use a water-dampened rag to wipe up any cleaner residue or spills on the oven floor, roof, and sidewalls. If you have a self-cleaning oven, you shouldn’t be using chemical cleaners since they can damage the enamel lining of these ovens. Run short self-clean cycles in pre-washed ovens. Smoke that comes from your oven only during self-clean cycles usually stems from food being incinerated under the excessive heat of the cycle. To reduce the volume of smoke generated by burning food during self-clean cycles, turn off the oven and let it cool completely, then wipe away wet food residue from the oven interior with a water-dampened rag and start the self-cycle again—this time at the shortest possible duration to prevent excessive heat buildup in the oven. Replace faulty heating elements. In electric ovens, smoke emanating from an oven during a self-clean cycle can also signal an impending short in the heating elements as a result of excessive heat buildup. These elements are known to briefly buzz and produce smoke before failure. The easiest way to check if your heating elements are functional is to turn off the oven and then turn it back on. If the bake element (usually at the bottom of the oven) doesn’t glow red while the oven is in “bake” mode, or the broil element (usually at the top of the oven) doesn’t glow red while the oven is in “broil” mode, the non-glowing heating element most likely needs replacing. Replacement entails cutting the power to the oven from the breaker box and unplugging the oven, removing the screws and wires that connect the element to oven, and detaching the nonworking element from either the top or bottom of the oven. Then, once the new part has been ordered, you can install it and re-attach the wires and screws before restoring power to the oven. A do-it-yourself heating element replacement will run you $15 to $40 in parts, while a professional replacement will run you anywhere from $60 to $130 in parts and labor. Reduce gas pressure. In gas ovens, high gas pressure commonly results from an improper conversion of the oven from natural gas (a fuel it was originally designed for use with) to the liquid propane fuel type. Higher pressure can generate taller and hotter oven flames from the main burner at the bottom of the oven, which can, in turn, cause high volumes of smoke. If the flame from the main burner meets or exceeds the height of the oven racks, the gas pressure is too high and the risk of an oven fire occurring during use is greater. Consult the oven installer or your gas company to safely correct the conversion—this should reduce the height of the oven flame and stop the oven from smoking. • Safeguard your oven from spills by placing food in baking or broiling pans before cooking; avoid placing foods directly on the oven racks. • If your oven has multiple tiers, lay a fireproof, non-stick oven mat on the bottom rack to catch drips or debris from foods placed on the upper rack. • Maintain a clearance of at least three inches between food and heating elements in electric ovens; food placed too close to the heat source will readily smoke or catch fire. In gas ovens, maintain that same clearance between food and the main burner (at bottom of oven) and the broiler (at top of the oven, if your gas oven has a broiler). • Following oven use, wipe down wet food or liquids from the inner door glass, sidewalls, floor, and roof with a water-dampened rag. 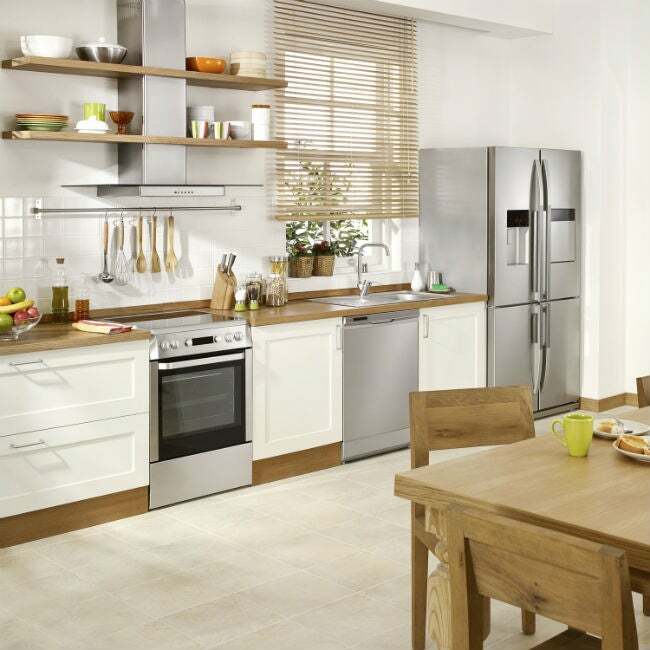 • Clean the interior and racks of your oven on a monthly basis. • Use the self-clean feature no more than five times each year.